One is spoilt for choice at Hudson lane in GTB Nagar. It caters to every mood with an array of eating joints. From Korean to Italian, you get it all here. Since it is very close to the north campus of Delhi University, this area frequently hosts students who come here to slake their taste buds. The only way for an eatery to survive here is to be different from the others in every possible way. And Woodbox Café has managed to endure this wild race successfully. 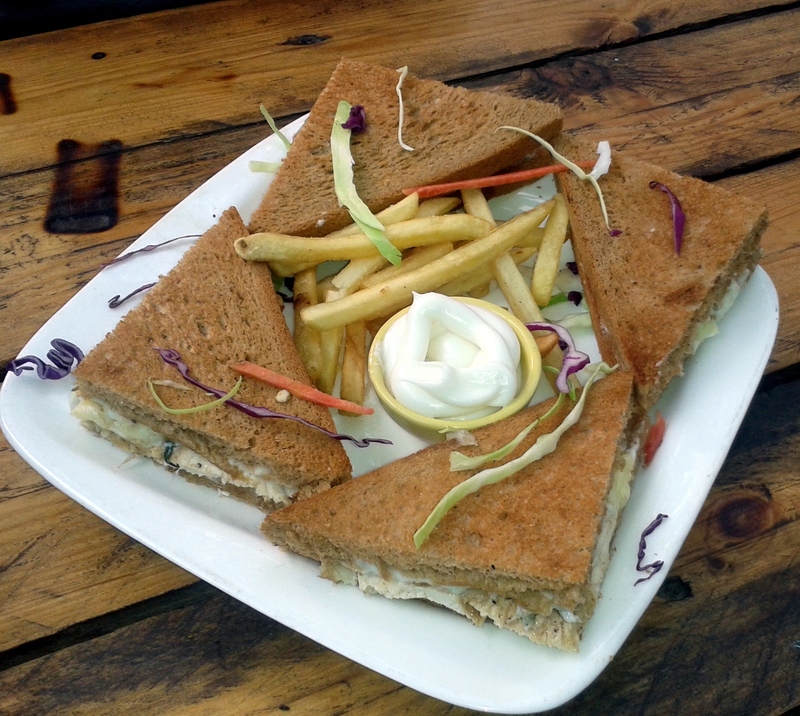 With its avant garde interiors and economical prices, Woodbox Café is a hit with the college crowd. At a walking distance from the GTB Nagar Metro station, Woodbox Café has something which many other restaurants lack-space. It has a rooftop and underground seating arrangement as well. The walls are designed in a very non conformist manner using pieces of cloth, forks, spoons, nuts and bolts, pins, etc. They add vibrancy to the whole décor. The hanging lanterns are made from strings, straws, playing cards and artificial foliage. The rooftop area is equally well decorated with broken glass bottles embedded in the wall. 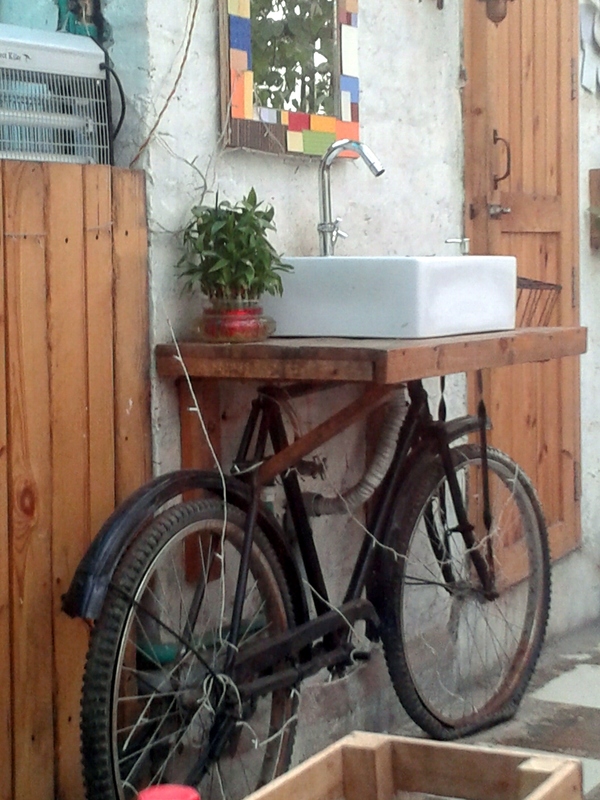 The wash basin is fixed upon a bicycle and over it is an old fashioned, rustic yet interesting “Victoria station” wall clock. In the evening, fairy lights adorn the canopy-like seating arrangement. With such striking interiors, it scores high on concept and designing. Another advantage that Woodbox Café has is its location. It is situated a little away from the main road and thus has a peaceful environment. Every dish on their menu is presented well with appropriate condiments like breads, etc. Kitkat shake and Ferrero Rocher shake are lip smacking beverages which are widely popular amongst the regulars here. Their black currant soda is something to look out for. Neither very sweet nor very salty or fizzy, it is the perfect drink to quench your thirst. All drinks are served in Heineken or Grey Goose vodka bottles neatly cut to make glasses; an exceptionally innovative idea widely welcomed by the visitors. The Chicken Caesar Salad has a generous amount of chicken shreds along with a delicious dressing. 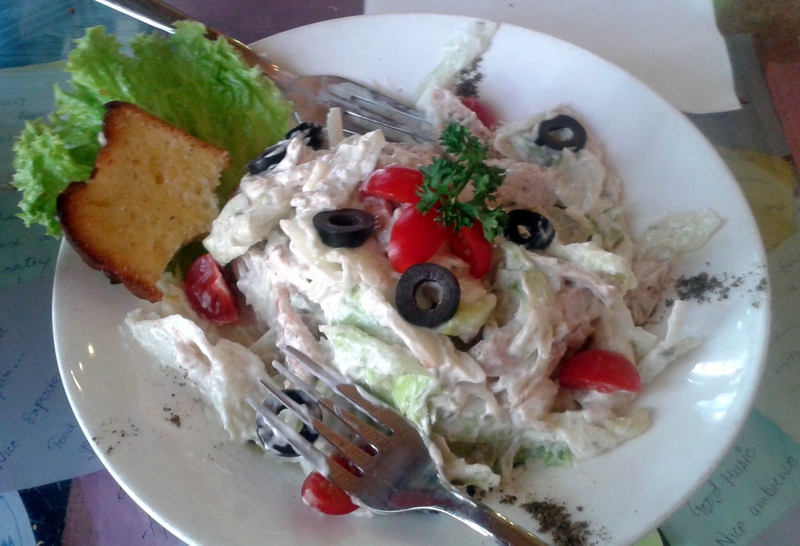 It is much better than the nearby rival, Ricos’ Caesar Salad. For vegetarians, the Grilled Mushroom Sandwich is a blessing from the heavens. Each bite has a sumptuous filling of juicy mushrooms and cheese. For non vegetarians, Cheesy Grilled Chicken Sandwich wins my vote. The chicken is grilled to perfection with the requisite spices mixed with garlic, thyme and cheese. Sandwiches are served with crispy salted wafers and a dip. The crispy honey potatoes fall flat with their not-so-appetizing flavor. The Picante Pizza is a specialty of this place. Topped with jalapenos and bell peppers it tingles your taste buds with its piquant flavour. The Indiano Chicken Tikka Pizza is a delight for the eyes and mouth. Biting into these thin crust pizzas will transport you to Italy and its rich legacy of pizzas. Penne Arabiatta is the usual white sauce pasta; tasty but nothing exquisite. Their Spaghetti Aglio Olio is a personal favourite. Laced with seasonings and chilli flakes, it is the best spaghetti I have had so far. It’s better than their other entrée, Roman Spaghetti. The pastas too are served with buttered garlic bread. Also, their Chicken Lasagna tops my list of best lasagnas. It is baked exceedingly well with a liberal topping of cheese and spicy minced chicken filling. I guarantee that this dish will leave you asking for more! Woodbox Café is a one of its kind food chain as it works towards not just providing classy dining experience but also promotes a healthy environment. They have erected a big junk collector outside their restaurants and provide attractive discounts to people who bring in junk like papers, magazines and similar dry waste. They also have thematic menus served according to different festivals. “We are constantly re-innovating our menus and interiors and for that purpose constructive criticism is always welcome. We plan on taking the brand to other towns like Chandigarh and Dehradun”, says Manika. They recently opened ‘The Vintage Avenue’ in GTB Nagar which is fast becoming a rage with the students owing to its floral and old world interiors. Woodbox Café is definitely the place to go if you want to have a holistic foodie experience replete with good music and prompt service.